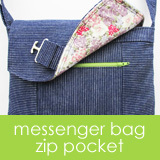 Two larger sizes have been added to the Zip Pouch pattern. The little one still seems like a pouch, but the bigger ones seem more like clutches, so I've changed the pattern name to Zip Clutch. If you've already purchased the pattern, and would like the newest version with the two additional sizes, send me a note letting me know the date you purchased your pattern. Once I verify your order, I'll send you the instructions for ordering the newest version of the pattern paying only the price difference ($2). There are also some great tips for resizing the pattern here, if you want to do it on your own. One of the several projects I have going on right now calls for a light blue fabric with a small print. Of course, when you are looking for something it becomes so elusive! This blue print is very sweet and I'd love to have a yard or two, but for this project I'm really looking for something just a shade or two lighter. Anyone have a suggestion for a light blue fabric with a small print or a print that is fairly subtle? Customer Creations - How Cute! I was browsing through my flickr groups, and stopped by to see what people have posted in the Keyka Lou Patterns group. Imagine my delight when I saw this adorable bag! This Garden Party Wristlet is sewretrochic's creation. She used Amy Dots in Fuchsia from Jennifer Paganelli's Bell Bottom collection. It is really fun for me to see what people make with the patterns. Because I'm looking at the pattern listings daily and seeing the same photos over and over, I get stuck thinking about them in terms of what I've made. So it is refreshing to see them in other fabrics. This bag also surprised me because I didn't recognize the print, even though I had seen before. The fabric has the graduated dots running from left to right, and sewretrochic has turned them around on her bag. Brilliant! Stop by sewretrochic's blog where you can see what else she is sewing and place custom orders. 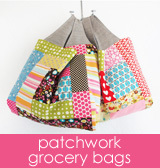 This weekend I'm sewing a couple more grocery bags. 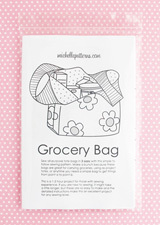 They are easy to make, sew up quickly and are very useful. It is also nice to make something using only the most basic sewing ingredients--thread and fabric. Since they need to be durable, I've been using a double seam. The double seam is just like it sounds--two seams. If the first seam comes undone, the second seam provides back-up. The double seam also helps distribute the stress on the fabric. When I make a hand bag or clutch, I always double stitch the lining. For the grocery bags, I want them to be really strong, so I'm double stitching the side and bottom seams of both the focus fabric & lining fabric shells. When using a double stitch, you won't be able to press the seam open flat, but can still press it to one side. On bags the top side seams can get really bulky, especially if there are multiple layers of fabric, interfacing and interlining (invisible lining). My preference is to press the seams flat at the top sides whenever possible. To be able to continue pressing the top side seams flat, I'll start & end the double stitch about 1.5" from the top edge. Then I can still trim any extra interlining (invisible lining) back close to the seam, and press the seam open flat at the top. Reprodepot is offering an additional 20% off everything in their sale section. The coupon code is sale20 and it expires on 2/22/10. This Alexander Henry print called 2D Zoo is not new, but it has been updated in three new colorways. I love this chocolate version. The mix of colors is perfect. Though I'm not super fond of orange, I have always liked it when paired with purple.